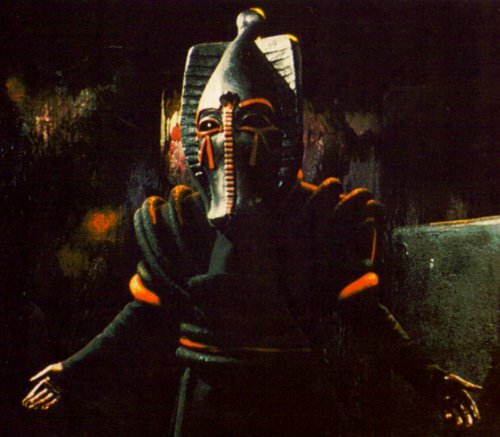 The last living representative of the Osirans, Sutekh was so immensely strong that it took his brother Horus and 740 of his fellows to bring him low. Even then he was only imprisoned in an Egyptian pyramid, held immobile by the Eye of Horus hidden millions of miles away on the planet Mars. When his tomb was disturbed, Sutekh dominated the mind of archaeologist Marcus Scarman and through him sought his freedom. Aided by mummy-shaped service robots and various Egyptian-themed pieces of alien tech, he eventually forced the Doctor to bring Scarman to the Pyramid of Mars. How bad was Sutekh? So bad that he could’ve single-handedly laid waste to the entire Earth, as the Doctor proved to Sarah Jane Smith when he took her forward in time to view the blackened remains that would result if the two of them failed to stop the evil Osiran. I hope that you’ve enjoyed this month-long look back at the fiends and foes of classic Doctor Who! I’m probably going to take a few days off from blogging after this marathon, but come back soon for more geekery!